Without belaboring so sublime a theme as ritual catholicity (divine tradition and worship), let it be also noted that, in several pages of his latter book on the Liturgy, our present Pontiff left the liberal liturgical “experts” no leg to stand on in his strident rebuttals of their dishonest contention that the ancient Church offered the Mass facing the people. “Never,” in the East or West, was this ever the case, he argued. Loreto Publications is more than hopefully optimistic that Benedict XVI will do everything he can to foster a complete restoration of not only the Latin language in liturgical worship, but the traditional Roman Ritual as well. Oremus pro hoc. In anticipation of this true “reform” we are now offering our retailers the first in a three volume reproduction of the entire traditional Roman Ritual with the Latin orations and the literal English translation side by side. 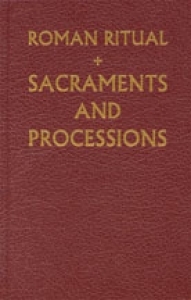 Volume one of this indispensable liturgical manual includes the complete liturgical formulas for six of the seven sacraments and their ritual rubrics (in red print), followed by the traditional prayers and rubrics governing the proper ceremony to be observed in the various kinds of religious processions that fall under divine worship. Being that this Ritual is for priestly administrations, the ceremony for the consecration of a bishop is not included. In special cases a priest can administer Confirmation, therefore the Ritual does include that rite as it is ordered to this special ministration. 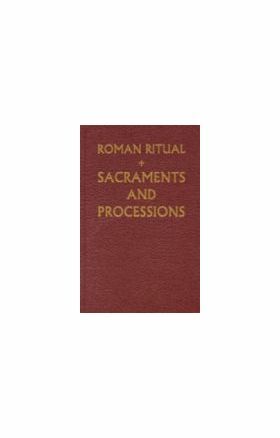 Volumes II and III of the Rituale provide the formulas and rubrics for all other liturgical rites, including Catholic burials, exorcisms, and official blessings, both ordinary and reserved. RRI is wonderfully put together in a clear easy to read font. The richness of the texts is truly something to experience. Loreto Publications has provided a great service to the Church in reprinting this timeless volume.